Some days just call for a warm, comforting bowl of soup. I’ll be honest, I cheerfully devour soup in sweltering hot weather just as easily as slurping down a bowl in the middle of winter cozied up beside a roaring fireplace. 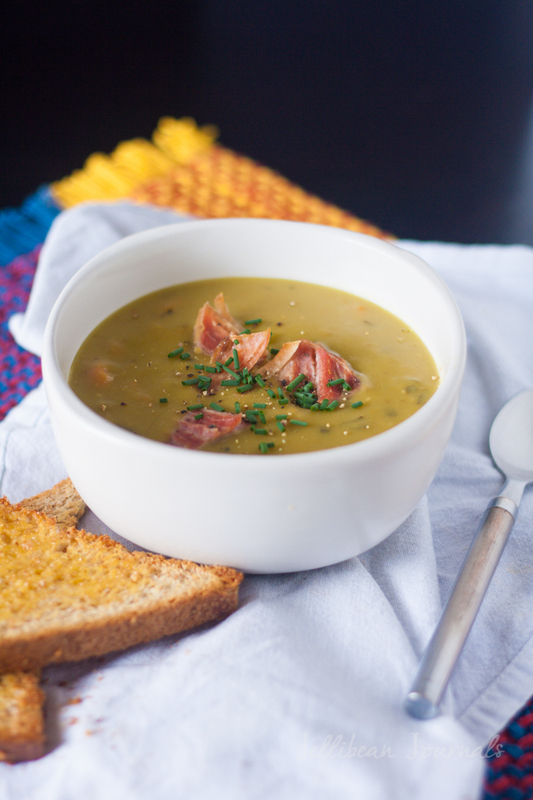 Split pea soup with ham is one of my all-time favorites. 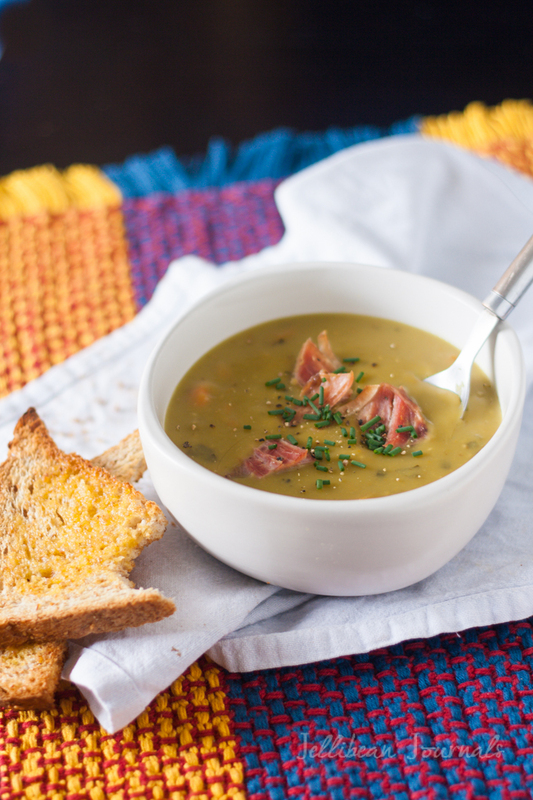 Split pea soup is quick and easy. It’s perfect for the novice cook and anyone hoping to get dinner on the table in a hurry. All you’ve got to do to make this rich, hearty soup is toss a few ingredients into the pot and wait while it simmers away. Serve this soup with artisan bread and a glass of wine and call it a feast. It’s such an easy and inexpensive meal that’s actually nutritious and delicious too. Photogenic…not so much, but I did manage a few decent pics courtesy of the tips I learned here. This soup so good that you can even make it without the ham and still get a bowlful of bonkers good flavor. I’ve done that a time or two when the supermarket didn’t have ham bones and was amazed by how great the soup tasted even without the smoky ham. I made this recipe in a pressure cooker. 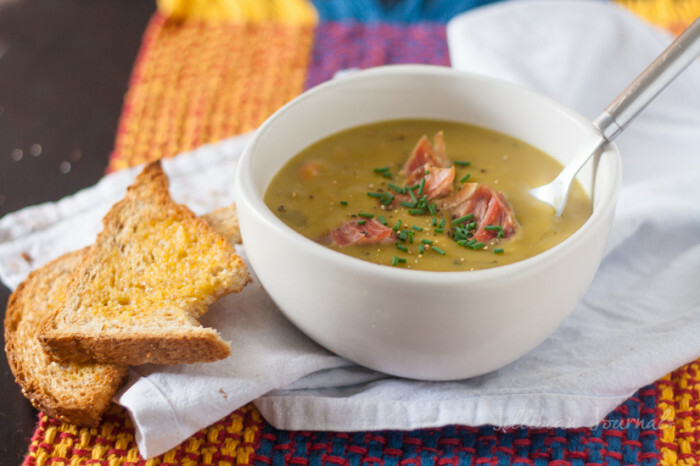 Split pea soup is highly adaptable and turns out just as yummy in a pot on the stove for about one and a half hours or in a slow cooker. You can bet that if my Crockpot hadn’t cracked last month that this would have been a slow cooker recipe, that’s how I roll when it comes to soup. Place all ingredients in pressure cooker. Bring to pressure over high heat. When the pot begins to sizzle reduce heat and cook pressurized for 20 minutes. Remove from heat and allow to sit until depressurized. What are your favorite soup sidekicks? I love to serve soup with crusty baguettes, garlic cheddar biscuits, or just plain buttered whole grain toast. Yes, we’re bread-a-holics around here. I do love soup with salad too, but if I tried to force my husband to down both soup and salad in one sitting he’d probably hop into the car and head to the nearest restaurant. He’s a Mafalda. Thankfully, I can make big pots of split pea soup without worrying about finishing it all by myself because my toddler loves soup… and pretty much every other food she’s encountered. It’s great!Don’t forget to share your favorite things to serve with soup down in the comments below. For more tasty treats and recipe inspiration be sure to follow me on Pinterest! Ive never used a pressure cooker, but have been dying to try it out. This recipe seems perfect with all this weather!! Sara, before I moved to Costa Rica, I’d never even seen a pressure cooker. Since everyone here uses one (they’re great for cooking dry beans!) I learned how and now use mine pretty regularly. Don’t be afraid of it blowing it’s lid. It’s safe if used as the directions tell you and is great for making soups and tenderizing meats. Hope you give the soup a try! I’ve never made split pea soup, but I love the ease and convenience of making tasty, healthy soups from scratch. (Though, as you pointed out, a lot of veggie soups don’t LOOK nearly as good as they taste!) 🙂 Maybe I’ll pick up some split peas at the grocery store tomorrow! Jelli, I’m all about this soup with that glass of wine… and the bread, of course. But, having it all by itself would just be amazing in itself! Thank you so much, Gloria! The soup is great alone, but what dinner doesn’t go great with a glass of wine, right? Happy you stopped by tonight. Have a beautiful week. Split pea soup is one of my favorite soups!! I love this recipe and using a pressure cooker is such a great idea. I love split pea soup, I love soup! My kids occasionally put up with me making soup and probably would put up with this if I made a ham first and used the left overs and bone in it. I think this will go on next weeks menu! 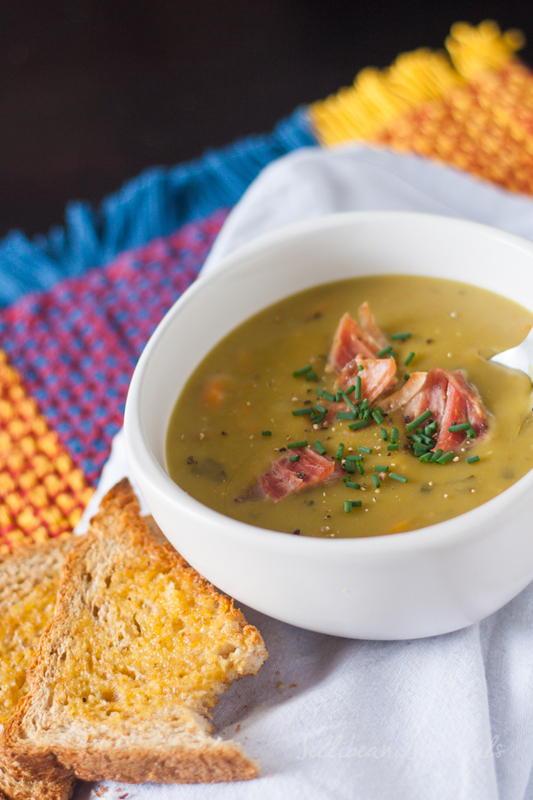 I love split pea soup, but never thought to use my pressure cooker. I am putting this on the “must make” list. Thank you, Bren. The pressure cooker worked great, definitely sped things up a lot compared to simmering stove top. Hope you and your family love it. Kelly, I’d have totally made this in my crockpot if I could’ve, but the pressure cooker, as I’m slowly finding out, is great! Hope you’re taking good care of yourself and that sweet little one these days. Enjoy new mommyhood second time around! Jelli! This looks so healthy and tasty. I forget how much I like split pea soup. I don’t know if I have ever made it for my kids. I will have to remedy this with your recipe. Thanks for sharing. Rach, your kids will love it! My daughter is a crazy soup fanatic and gobbles it down in seconds. Thank you so much for visiting. Be sure to stop back and let me know how you liked the recipe. I cannot wait to make this and eat up! It sounds and looks amazing! Hi Jelli! Thank you for linking up your Pea Soup to our Inspiration Monday Party. One of the perks to linking up is that you may be chosen to be featured on “Redhead’s Kitchen”. Your Pea Soup fits my theme “Green Veggies” this week. You will be featured this Wed. @ 12 noon EST @redheadcandecorate.com. Every week I will list the theme at the bottom of the party. In addition, your soup will be featured @ Debbie Doos next month when I do my contributors post. Congrats! Yay! Thank you so much, Julie. I love Inspiration Monday and have been linking up there since the party started. So happy you liked the recipe. how many pounds pressure did you use for your 20 minutes, is it the same for beans? You know, Vic, I have no idea how much pressure my pressure cooker uses. It’s just a standard US pressure cooker. If it helps, it takes about 30 minutes at pressure to cook black beans in it to perfection that have not been soaked.